1Creative Spot offers activities, classes, and events for all ages. Our main focus is to allow for creativity, innovation, and nurturing of young and old imaginations through the visual arts. We want to provide a fun place to learn, create and explore. Artists are encouraged to get their hands messy, think outside the box and to make their art their own. Some of the activities we offer are: Art Adventurer’s Art Class, Creativity Club, Summer Art Camp, Birthday Parties, Home School-Hands-On Art Classes, Scouts/Troop Lessons, and Mom and Me Art Fun. We also have canvas painting events for adults. Check out our calendar for upcoming classes and events. 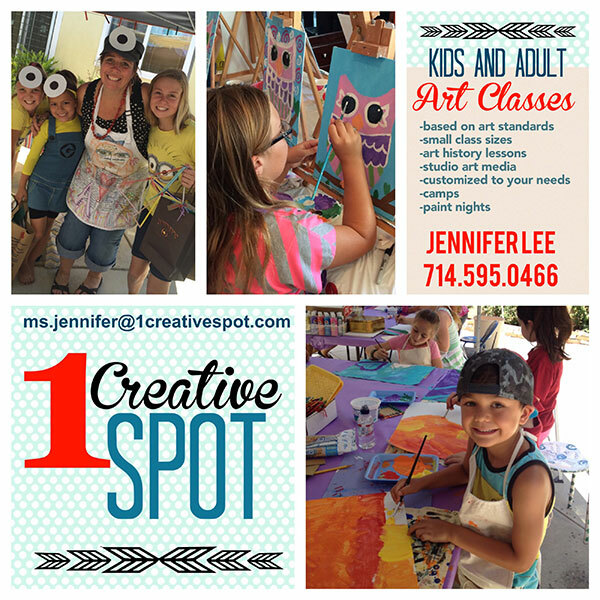 1Creative Spot is run by Jennifer Lee, who has worked as an art teacher for over 19 years. She gives kids the opportunity to be successful in a creative way, allowing for problem solving and innovative thought processes. For more information, please browse our website, “like” us on Facebook, or call/text Jennifer Lee at (714) 595-0466. To learn about new classes and events, join our mailing list. You may also email ms.jennifer@1creativespot.com. Happy creating!